I know a flash version of FIFJr exists, as do several clones ,etc. Anyone know the best version of the game, or the version best suited to an arcade cabinet. I recall on YouTube there was a video of somebody who had won one of the promo cabinets, but I dont know if the game was ever made available. It is intended for switching joystick maps for a U360 Stik but I recently added Fix It Felix Jr support. I have a DK JR cabinet in my collection, its a vertical MAME + Mala set up. I'm staying @ my parents this week so I hope the links remain in this thread. Because over the weekend I'll look to add this to the cabinet. EDIT - I'm not that computer savy. So I'm not sure how easy it is to patch/tweak the game. Does anyone know if the "leaked" version can be found in a complete form with all the patches done ? Like one simple ROM or EXE file to install ? Side note - that reminds me, I really should make use of these extra USB wireless internet adapters I have. Giving me the ability to move files to both my MAME cabinets wirelessly. I'll get on this over the weekend. WHOOOOOOOOOO! Going home tonight so when I obtain Boardwalk Empire and SOA I'll get these files and prepare to move. Thanks again guys for the info. Thanks for this thread, I've been looking forever for the actual Disney version. Do we need a wrapper that'll let you set the controls? I can probably swing doing that. That's not a bad idea Howard. I just used a AHK script to re-map/configure the set controls for the game to what I wanted them to be. There also exists a separate AHK executable that sets up a bezel and centers to the game for a horizontal monitor. So...I don't know... maybe you could combine the two ideas into one if you were up for it? Yeah I'll mess with it this weekend. You don't mind if I look at your ahk do you? I'll make it purely for selfish reasons btw... I've got a pacman cabinet and it's controls are joystick only. I've got the game set up on my everyday PC, trying to configure so I can move it to my DK JR MAME cabinet. The cabinet is a vertical monitor with MAME + MaLa. Even when I switch the orientation of MALA FIFJr still launches as if it were a horizontal monitor. Furthermore I set MALA to use hotkeys, however when I exit upon escape it says the process is still running. Attached are a couple of "zip" files including the AHK file I use to launch 'Fix It Felix' along with a blank (brand new.ahk) wrapper file. The AHK file (Fix It Felix Jr.ahk) remaps a few controls and then launches the wrapper, found online, designed to make the game run on a horizontal monitor with a digital bezel. Perfect for my setup. I hope this helps. Change the .zip on the end of the extention to .ahk for both files. Mike, if you have a vertical monitor on your cabinet, you should be golden. No need for the wrapper. Just run the game via command line. Fix it Felix runs natively on a vertical monitor. Otherwise check out the following link and use the -rotate command. The default rotation should be all you need, I believe, to run on a vertical monitor. Thanks I'll mess around a lil more. Ok this is something that should probably be mentioned. If you have windows setup to where it displays vertically on your monitor (like through your video card) you probably should NOT set the rotation option. Ok so I've got my hacking tools all hooked up to this thing. Apparently there is a -network and a -settings flag for the command line options? Another thing that is missing from this "leaked" release is the ability to save high scores. The high score table always resets after reboot. There seems to be a missing file (Scores.dat). Find or create. It would also be nice to have save state ability. It seems to be a programmed part of the game (press F5) but unless you have the support file...I don't, and can't find it online, (Save Game.dat) you can't save a game. F5 Saves data to "../Save Data/Unknown Save Game.dat". - If not present game will crash. See the "NOTES" section in the link pasted above in my post here. If anyone can figure out these nuances, it's you Howard. With my set up I have Mala set to display a vertical image, when you boot up you see the Windows screen isnt rotated. It's just Mala that rotates the image. With the FIFJr the games comes up windowed. I changed the name of the EXE file and I got the game to flip....but I can't get fullscreen. I'm not home now so I'll need to play more. Thanks for the link... I got it working (saves at least). Now as to what it saves, I'm not sure. It does generate the unknown save game.dat and put some data inside. I've looked inside the code, but some of this stuff definitely isn't hooked up. It *might* be possible to fix the high score because p2 high score works, but atm I don't want to dive into that. I finished 90% of the wrapper last night..... I'll go ahead and finish up today probably (it just needs joystick support). One issue I've noticed is that remapping to the left alt key doesn't seem to work. I'll make sure it isn't on my end, but I think it's just the game. A lot of games can't handle having the "alt" key pressed. So I doubt it's hooked up to anything useful. I guess I forgot that this game was never commercially release and thus doesn't have any encryption. If I set the credits to a negative value, it's essentially freeplay for palyer 1 games. Man I should never look into this stuff... it always leads to a bigger project. Anyway I'm fairly confident I can modify the UMKKE wrapper to manage and alter all of these memory locations. It would be trivial to read and save the highscore table as well as the top scores upon exit, and even keep track of the coins. I might want to see if I can find the input area... it would be more efficient to alter that than to write a keypress simulator (which I've already done unfortunately). Well that wasn't too hard. Via my wrapper I've repaired the High Score and have written a function to load and save it along with the initials table and the number of credits remaining. I'll clean it up and release a beta here in a few seconds. Ok guys try this out.... it isn't done yet, so this isn't an "official" release, but I know how I get distracted, so maybe I better release what I've done for now. Put these files in the same folder as the exe for the Disney version of the game. You'll be able to remap keys, set the exit button and all that jazz. In addition the wrapper monitors the memory locations for the scores and coins and will save that stuff to HIScore.dat, loading it back into the game upon the next launch. If you wish to make a bezel, crop it to the appropriate dimensions and save it as bezel.jpg, putting it in the same folder as the exe. Note that the game seems to have issues remapping things to the alt keys. Other than that, enjoy! Howard, I can't thank you enough for tackling this! I would love to be able to run FIFJ properly on my cab! The key configurator doesn't let me assign the arrow keys (?) so I used the keys corresponding to "Player 2" on my CP. But the configurator doesn't seem to remap any keys whatsoever. Maybe I'm not doing it right (?). Well the arrow keys are defined by default... no need to remap them. To remap a key to click on the box next to the label and then press the key you wish to remap it to. Remember to save when done. What OS are you running? I built this on win 7.... haven't had a chance to test it on xp yet. I'm running XP. Working fine now that you coached me except the top and bottom of the display get cut off (my cab uses a TV as its monitor). If I zoom out to 50% then of course I can see everything but that doesn't look right. Any chance you can make it so I can zoom out to 95% or 90%? Nope... unfortunately the available screen sizes are hard-coded. I tried manipulating them and the game just wouldn't let me. I'm not saying it isn't possible, I just can't figure out how to do it. For 50% it's 640x480, which unfortunately gives a lot of extra space. If you can get your tv to run at a smaller resolution that'll still fit in a image that's 320 pixels high, that's what you want to run it as. Just tried it and seems the configure FIFJ file has the path set to C:\Development DON'T ERASE\sources\Felix Wrapper\build and will error out unless the FIFJ.exe file is in that location. Once placed there it works fine (wanted to change it to run horizontal rather than vertical so had to figure it out.) - not sure if the hardcoded path was intentional or not so figured I'd mention it. That's just a stupid thing windows does. I saved the shortcut as "FIFJ.exe -settings" and it tacked the rest of it on. In windows 7 it automatically finds the new location and fixes it... on other OSes sometimes it does, sometimes it doesn't. Hey so I was goofing around with the hex editor waiting for my next tv show to come on and I found the multiplier for 50% zoom! Even if I can't find the others, I should be able to set the zoom to 50% and use this to scale the window properly. Ok I've managed to do a "fullscreen" mode for horizontal orientation! Now a little bit of hackery had to be done to get this to work. Essentially I can't inject the new value to memory before the window is already drawn so I simulate the pressing of Alt-Z and 1 to reset the zoom just before I alter the window. I had to set a delay, so if it isn't working for you that is the issue and I'll add an option to adjust it later. Just use the fullscreen checkbox to use the new mode. Oh also there is a small mis-calculation in regards to the window area due to the fact that the menu has to be visible before the window gets resized. To compensate for this I set the vertical position of the window to around -16 I tried this at 1600x900 and 640x480 and it looked fine on my system so that should be fairly universal. As per usual the download is below. Once I add in joystick support and a few other goodies I'll make a proper release on my site. Awesome work as usual. We all thank you! Awesome work Howard and much appreciated, finally someone capable is tackling the original release of this game. On my horizontal screen it comes up sideways in the top left corner with your 3rd release, the options are blacked out and not selectable so not sure what the problem is or how to 'fix it'. On your first release it is centered in the middle but not full screen, which I assume had not been added in yet. & thanks again for the work! There isn't anything I changed that would make the game rotate unless you set it that way. Perhaps you have a weird setup? Maybe a rotating monitor? The reason I ask is because it sounds like the wrapper is treating the screen as if the left is the top and it's displaying it sideways because your monitor is set to the wrong orientation. You see, in the second release I simply centered the game. Regardless of orientation that'll work. On this release I had to hard-code the "top" value to -16 to compensate for the menu distortion of the gameplay area. I figured out how to do a freeplay mode, even changing the credits message to "FREE PLAY" via the help of a little exe patching. I also found where the initial lives value is hiding, so I can add and option for that. I can't seem to find the 1up multiplier. I was wanting to add "dip switch" settings similar to the ones on Donkey Kong. Just tested the new version and it's working great on my 1920x1080 monitor - displays properly in fullscreen on either horizontal or vertical - can't wait to test on the bartop once you get the joystick support working ! Got some really talented people here! Here's to you Howard! Believe it or not, this is easy stuff... to me this is a vacation from mkke modding. So I found the input bit.... If I send the input status via manipulating this bit instead of simulated keypresses, the alt key is now usable. It has issues with me sending the start/coin up buttons but that shouldn't matter because they are non gameplay keys so I can just use the old method. This is what I was waiting on before I added joystick support... it is far easier to do it this way. Oh I ran into an issue and I was wondering.... do any of you guys have issues getting Felix to jump to the left or right? I thought it was my code, but I played the original and the issue persists... unless you hit left/right and jump at the perfect time, he just jumps in place. I'm currently testing with my keyboard, so that may be the issue, but I was wondering if this was a bug in the game's code or a hardware issue. Don't know if this was covered, but CREDIT = C on keyboard for Fix It Felix Jr, where as in MAME CREDIT = 5. For myself wanting to host this on my cabinet I'm using an iPac for my encoder. Can this be changed with the wrapper ? I'd like all the functions to follow the default MAME keys if that is possible. I still need to solve my rotate issue, I hope to try this Howard when I get home. Yep the wrapper can be used to change it - just run the configure FIFJ.exe and left click the mouse in the box for the key you want to change and then it will come up with a prompt to press the key you want it set to just press 5 and it changes the setting then when all is set save it and it's good to go !! Also if anyone wants it I made a Bezel for my 1920x1080 monitor for use in horizontal mode just place the file in the same folder and it will load with the game - I attached it below if anyone else wants it. and a screenshot of it while playing to show what it looks like in place. I'm going to get this working all perfect then move it all over to my DK JR. The DK JR is a MAME cabinet so it's a pain to move everything onto a fash drive and work with the rotated monitor. But once working I'll do ! Off topic, can I simply just move the folder over to my other computer ? I unzipped the contents of the most recent wrapper zip and placed them all in the FIFJR folder. I can't however launch the configure FIFJ. I get the following error (see image). Over and above that this is great, it is launching fullscreen and with the correct orientation. Question - Do I delete the other EXE file (the original EXE file) ? You can see the contents of my folder also. Howard, I can't thank you enough for taking this on! Been dreaming of playing this game ever since I saw the movie! The screen still doesn't look quite right on my cab. I can see the full text of how many credits I have (I think this was cut off before your latest version) but I still can't see the player score(s) and high score at the top. As for the original exe don't delete it the new file actually runs it still as it loads the game so it is still needed ! If I click the configure FIFJ nothing happens. If I click the FIFJ exe file the game launches and is full screen with the correct orientation. Now when I go in MALA and point MALA to the FIFJ exe I then get the options. So I was able to configure 5 as coin 1 & 2, but the game wont launch, just the configure options. I make the changes and save. If I exit MaLa and click the FIFJ exe the game launches and 5 does coin it up. But I need to be able to do this from MaLa. If I click FixitFelixJr exe its the original version not zoomed, with the wrong orientation. EDIT - and like a few of you said my screen is also slightly cut off @ the top. I don't have it set that way and simply changing between your releases makes it happen without changing anything else. Not a rotating monitor and not set as such. I have been testing it on my gaming pc with a GTX680oc, Win7-64 & displayed on a 27" Asus 1920x1080p so nothing odd. * One other thing to note... my taskbar is still present at the bottom while the game is running. In this first video I launch the original EXE and then the other EXE file. This FIFJr will be later installed in my DK JR cabinet which has a vertical monitor. So the version done by Howard is great, and will be the correct orientation when in it's final home. You can see how both launch. Here you can see what happens when I launch Howards EXE from Mala. Mike Boss, mine gets more than that cut off at the top. I can't see any of those numbers at all. I can use release 1 on my cab and it centers the playfield but it's not filling the height of the screen and is a bit too wide. This is on a 26" 16:9 monitor that is 1024x768 native (great lcd screen for arcade cabs). Nothing gets cut off on my playfield however, can see credits, hi score and number of lives. Maybe some form of aspect ratio control could be useful..? Hmm -- not sure why but mine seems to scale properly to any resolution I set my desktop to -- just tried 1024x768 using this resized bezel and it fits fine full screen centered. Here's a copy of the bezel if you want to try the files I uploaded earlier with a 1024x768 bezel. Thanks, I'll give that a shot (along with what you posted above). No problem - Hopefully it works for you as well - let me know ! I noticed you guys arent using cooler sound effects. Replace 9 and 19 in your DATA file with these, and you'll get better sounds, including "Im Gonna Wreck It", Fix It Felix!, and "I Can Fix It". Thanks Howard for a cooler version of one of my favorites. I cant wait to try out the high score! Thanks - that was next on the list of things to get for this ! mike: Any command land text and I mean ANY command line text launches the settings mode. So you have mala setup in such a way that it's passing some garbage to the exe. You need to fix that. I have no idea what I would need to do to fix this. Thanks for uploading the sound effects, I've replaced the old ones with these. You need to learn how to actually configure your frontend then. I can change the flag to only respond to "-settings" in subsequent releases, but this is really an issue you need to address. There are tons of exes out there that are going to panic if you send strange stuff through the command line flags. EDIT - Would this be a situation where a script would help resolve my issue ? I've never worked with them before so I have no clue if I'm even looking in the correct direction. Would this be a situation where a script would help resolve my issue ? I've never worked with them before so I have no clue if I'm even looking in the correct direction. Just make a batch file that launches Felix and point your front end towards that instead. That'll strip off any crap coming from the front end. I'll look into the batch file, thank you..
For anyone interested prior I had worked on a custom MALA menu themed after Fix It Felix Jr.
Not sure if there is an interest for it, but this thread seemed like a decent place to post the link. Off topic, so stoked to get this working again I thank Howard_Casto ! I will be creating a new version of the layout with custom load screen and sound effects. I'll post the link when done. To anyone looking to use it enjoy. Thanks so much Howard for making a complete working copy. I use Xpadder for the joystick controls, and it works like a charm. I decided to spruce up the bezel, and although I know its not "retro", I wanted something than garish yellow staring at me, plus I am such a fan of the film I'd rather see this. Download if you guys like! Be sure to rename it "bezel.jpg", and I had to resize the bezel in Photoshop to fit my 1360x768 resolution. This is the original 1920x1080 rez. So I created a batch file, I kept one copy in the Fix It Felix Jr folder itself, the other in a folder named "batch files." The batch file simply has the EXE name and is saved in the correct format. I tried pointing MaLa to the batch file in either location in the event the location was an issue, but no luck. Alright guys, unless somebody finds a huge bug or someone can point me to the location of the 5000 pts multiplier for the 1up's this is the final version. I've also included a reworked copy of the "official" bezel I found on the net. The bezel works differently now. It works more like mame. When in fullscreen mode it gets cropped. If you wish to show the full bezel, you can turn off fullscreen, set the zoom to 100% and the bezel zoom option will resize the playfield to fit. To you guys that made pre-cropped bezels, setting the bezel zoom to 1 should make them work... or you could rework them to make full bezels, your choice. Anyway, there are one or two oddball things in regards to the settings and limitations and I'll be busy tomorrow so PLEASE read the readme.txt. Also there are many new options, so your old cfg file is invalid... sorry. Howard phenominal work and I thank you. With this newest version I am able to EASILY launch Fix it Felix Jr! Not only that but your hacks work flawlessly, making this close on escape and the ability to match the controls to an iPac. Kudos to your sir ! Because joysticks are a bit sloppy to detect (off-centered analog sticks cause issues) you set the joystick settings manually by clicking on the drop down boxes and selecting the button number. The default settings are optimized for a 360 gamepad..... A and B are your action buttons, back button inserts coins, forward button presses 1p start, left shoulder is exit and if you really need it right shoulder is 2p start. Now hopefully I can get some time to install this on my pac-man cab this week and see how far I can get on good controls. I think I made it to level 6 or 7 testing on my desktop? Man those brick chunks are a ---smurfette---. I'm hoping to get this installed on my DK JR MAME/Mala cabinet this weeking. I'm using a inexpesive keyboard encoder from China so I suspect no issues with controls. Only issue I'll have is I'll only have the FIX IT button......no jump. Hoping the game is still fun. I'll also install is on my Donkey Kong MAME/Mala cabinet, but that is a horizontal monitor. I'm guessing since all is configured as I'd like I can simply just dump the folder in place and point MaLa to it. EDIT - I have the slight issue with the picture a lil offset. I think it could be because the resolution is too hi and the monitor is widescreen. I'm hoping when I move this downstairs to my other machine with a lower res that might resolve the display issue. Amazing work Howard! And thanks JDFan for cleaning up my bezel, I cant believe I missed that yellow dress. Last request, is there a way to remove the crosshair from the screen? Its barely noticeable but I would imagine once its on my cabinet I would have to use my trackball to move the crosshair offscreen. Thanks again for your amazing work! perhaps what I'll do is configure this game so my P1 start is jump and my P2 start is fix. That should resolve the issue, I have a seperate ESCAPE and CREDIT button wired to the underside of my Nintendo cabinet anyway. EDIT - any idea what I can do to get the hi-score to display on my screen w/o getting cut off ? Not to mention resolve the small black area to the right of my screen not quite filled in. 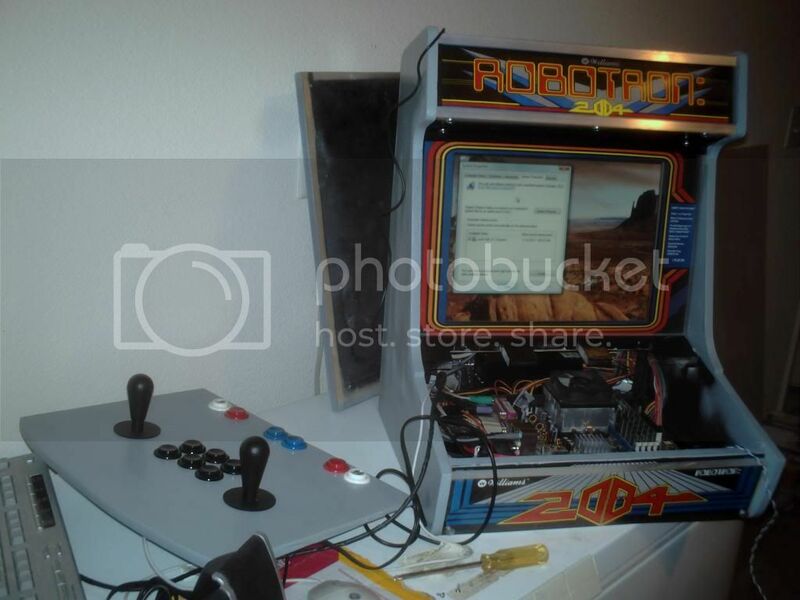 EDIT - I can probably modify the original bezel image (used on the cabinet) leaving a space in the middle open. Would anyone be interested should I do this ? What is the resolution of the screen you are playing it on ? -- If you go into the settings config file you can adjust the bezel size there using the bezel Zoom ( For my 1920x1080 display I'm using 0.95 for the bezel zoom and unclicked the fullscreen check box with the Zoom Level set to 100% ) with it set this way and using the custom bezel made for 1920x1080 display it sets it up to fit well. EDIT : Just did a bit of testing with different Bezel Zoom numbers and the lower you set the zoom % the more of the gamescreen is shown in the center of the bezel -- so try lowering you Bezel zoom number in settings.exe and it should get the high score showing ( be sure to uncheck the full screen checkbox otherwise it crops the bezel instead of using the zoom setting) - play with a few different settings and you should find a value that gets the game screen showing in the proper position on screen so that the entire screen shows and it fits properly - then it is just a matter of possibly needing to adjust the bezel art so it surrounds the game correctly for your setup. (if you need help with that portion take a screenshot using print screen and save it (can use cut\paste into Paint if needed) and it will probably only include the game screen not the bezel if you use prt scrn but that is enough to see the position if I know the res you are using so post a screen here and then I'll see about adjusting the bezel for you. I'm running (for now, for testing) this on a 1440 x 900 screen, but it's configured for a vertical monitor. With that said, for my inteded use I dont need a bezel. I just thought that perhaps as a thank you, along with the MaLa layout I'll post soon I could modify the original (cabinet used) bezel. No problem -- I think the Bezel zoom setting is what you need to adjust -- Here is a quick video I made showing the difference in setting it to 0.95 and then 0.66 to give you an idea of what the setting changes ! I'll take a look when I get in. THe dress was my fault as I had used the magic wand tool to delete the white and yellow background for cut\pasting the characters and didn't notice it deleted the yellow for her dress -- I fixed it after I pasted it the second time and the dress didn't line up in a yellow section so it was noticeable on the lower right side but never fixed the first paste since it was going to be on the yellow background anyway ! The program actually does move it off screen. It goes to the upper left corner of the screen. Has anyone measured the thickness of the Disney made cabinets? The T-molding looks wider than the standard Nintendo T-molding. I've also noticed that the Disney made cabinets all have 8 speaker slots. All the Nintendo conversions still have the 7 or 5 speaker grills. Nintendo cabs are strange to say the least.... If Disney re-created some, they most likely used 3/4 inch plywood so they would have an easier time finding parts. Demo Video for those interested. Note that the slowdown is due to my video capture software, it doesn't do that normally. Thanks for the demo video Howard. Looks great! Now all you need is to update some of the sound files in the game so you get the characters talking like in the movie version... "I'm going to wreck it!" (Ralph), "Fix it Felix!" (the tenants) and "I can fix it!" (Fix it Felix Jr) along with the updated sound of the hammer can all be updated to be exactly like the movie version. There's also an updated bitmap graphic (texture2v4.bmp) that fixes a few minor graphical bugs. Or...I can zip up the files I have carefully compiled and post here if you'd like. Thanks for your time and talent in creating this wrapper. You're a genius! I already had Fix It Felix Jr working great on my cabinet prior to this thread, but now I'm going to have to set it up again given your wrapper. I'm excited to get a MAME-style bezel (cropped) with a full vertical game view, high score save, credit save, and extra life setting. Any luck with a save state? I know some people prefer the updated sounds, but I don't. Notice the "copyright 1982" on the title screen? They couldn't put 48khz voice samples in a game from 1982. I know they've taken a few liberties on the color palette depth, but what I like about the game is the fact that it could have been released back then. It's intro is very close graphically to Junior Pacman, which came out just a year later. Now if somebody had a Gorf squawk board and ran the dialog through something like that.... it would be a different story.... I would definitely add samples that sound like they are being generated by an early 80's voice synthesizer. I would definitely add samples that sound like they are being generated by an early 80's voice synthesizer. Ok one more version. I ran across a bug last night were joysticks without a analog stick (aka the madcatz fightsticks) crash the game, so I fixed that. I also added a bezel mode for vertical orientation, which nobody will use, but hey, if you have a rotated 16:9 monitor, knock yourself out! What would be the minimum specs required to run this game ? Eh like I'd know. It's made by the guys that develop those plug-n-play games and run on their platform so I would say not much, BUT looking at the code inside the game it looks like zero hardware acceleration is used, so I don't know. Actually a bit higher than you'd think -- my bartop (Athlon X2 3800+ CPU) runs it like a slideshow due to the ATI xpress 200 chipset graphics and the low 2.0Ghz. operating frequency (might have to break down and put one of the old discrete GPUs I have laying around in it - It runs the old classics in mame fine so was surprised when this game wound up being a slideshow ) - figure I'll test it on another machine that has an old Nvidia 8500 in it and see how that runs it -- It does run great on my desktop (PII X3 720 CPU with active 4th core at 3.2Ghz) with a fairly mid level ATI 5770. I'm going to install it on a fairly modest pc tomorrow, so I'll let you know how it goes. I installed this on my DK JR MAME PC (P4 something) and it doesn't run. I'll need to try MSCONFIG, see if perhaps I can try something to help it run. Just throw it on your MAME cab. You don't need a dedicated. I'll see about testing the 8500GT in the bartop and see if that changes things when I get a chance and update the results. Last night I installed Howard's latest wrapper (ver 5). Everything worked out great. I tweaked the bezel zoom to my liking. High scores and credit tracking work great. full screen on a horizontal monitor with cropped bezel view. Awesome! One minor issue/question: I have Start Two Player button set to Keyboard #2, Coin 2 is set to Keyboard #4. Now... I want the EXIT key to be a combo of keys #2 AND #4. Is that possible? The setup menu doesn't seem to allow me to do that since those keys are already mapped. Problem now is that when I quit the game when pressing #2 and #4 together (works fine), it doesn't seem to track the credits and likely (need to test) any new highscores. Does that makes sense? Any thoughts? Perhaps change the 2 Lines --- ie. Reason it might work is currently you're closing the wrapper before the game so the wrapper can not save the game info when the game closes because the wrapper is already closed -- switching them so that the game closes first should trigger the wrapper to save the relevent info. Reason it might work is currently you're closing the wrapper before the game so the wrapper can not save the game info when the game closes because the wrapper is already closed -- switching them so that the game chloses first should trigger the wrapper to save the relevent info. Ahhhh...yes. I like it. Good logic. Thanks JDFan. I'll give it a go and report back. [EDIT] I tried the coding suggestion, but it didn't work. Luckily, Howard's latest version of his wrapper did (version 5.1). In that version the two key exit combo bug was fixed. I'm good to go! Fix It Felix Jr is now fixed!! Please don't resort to ahk scripts.... the whole point of this is to avoid those things. If you force close the app via external means obviously it isn't going to save anything. It looks like the exitkey2 is mapped wrong. So I'll fix that and release a new version. I launch mine using an AHK script that also maps the joystick and buttons to the correct keys. The script also moves the crosshairs using a command to move the mouse off the visible part of the screen e.g. "MouseMove 2000,2000,0"
*sigh* I guess I'm going to have to start repeating myself. The app already does this. It moves the mouse to the top-right corner of the screen and if the bezel is turned on, the cursor is set to invisible while scrolling over the bezel. While in true fullscreen mode the game hides it's own internal cursor. So in any situation, the cursor is hidden. Fixed the exit key bug.... I'm using a joystick so I didn't catch it.... sorry about that. Thanks -- Fix works perfect ! Your wrapper works fine. Thanks for sharing it! I have one request / question though: can I lower the resolution of the full screen display to say 640x480 to let my Mini-SLG scanline generator kick in? My desktop resolution is 1600x1200 for hyperspin. Yeah the easiest way would be to right click on the fixitfelixjr.exe (and fixitfelixjrfp.exe) and use compatibility mode to set the resolution to 640x480. I've helped you guys out, so maybe you can help me. I installed this on my pacman cab today and fix it felix jr (forget about the wrapper) refuses to run. I get an error prompt that says something like "Application not configured properly, check your settings and try again." Seeing as how the game doesn't have any settings, I don't know what that could be. I've got xp running on an old dell OptiPlex, running a rotated WG monitor that runs at 768x1024. I'm wondering if anyone has ran into this issue. Btw the issue might be that I don't have a good video card in the thing. It's just for pacman and the like, so I'm using the on-board "intel extreme" graphics chip, which actually does fine for a recent version of mame and my dx8-based front-end I built for it. That's really weird, but I'll try it later. I found a way using an external program (12noon's Display changer) to switch to 640x480, launching the game and switching back after it finishes. Try setting compatibility mode for the wrapper instead. That way it can calculate the new game window size better. I'm not sure why you are wanting to do this though... fifj's native resolution is 480x640, so on a horizontal monitor set to 640x480, the resolution will be reduced to half..... scanlines are great (I guess) but not when it reduces the game's resolution below native levels. It's called extra lives because that's how many EXTRA lives you start out with. You always have one life, the option lets you set how many extra ones you start out with, aka how many Felix heads. The default is 2, which is three lives total. Which is the game's default setting if I don't hack it. Well it doesn't work on my pacman cab.... too slow, so I'm done I guess. I'll make up a webpage for all of this sometime this weekend. I've got a Radeon 9600 lying around.... I might attempt to install it another day and see if it works, but it seems like a lot of effort for a single game when everything is running fine. My cat walked across my keyboard and hit the scroll lock key earlier tonight and it took forever (actually redownloaded the latest version and reinstalled as I thought something had messed up ) before figuring out that the scroll lock key was on !!! Yeah, I think that's a remnant from the pre-design days. You'll notice that clicking with the mouse makes Felix jump as well. I think that originally there was going to be a trackball variant until they realized how silly it would be to use a trackball to control a platformer. Well the specs of the pc I'm using is just a touch better than that, and I'm assuming a 9600 is faster than a 7000 unless ati reset their numbering scheme. So I guess I know what I'm doing the week of Thanksgiving. I'm guessing then, is the minimum specs for the game, at least in terms of processing power, is really low. Even though the game doesn't appear to do much in the way of hardware acceleration, it is loading several 1024x768 textures into memory (an odd way to do it to be sure). So my guess is you just need a card that'll load them all into video memory and not use virtual memory. Have you looked for a right angle adaptor? You can get em for around 20 bucks and they are a life-saver for tight-fitting rigs like that. I'm guessing then, as I minimum specs for the game, at least in terms of processing power, is really low. Even though the game doesn't appear to do much in the way of hardware acceleration, it is loading several 1024x768 textures into memory (an odd way to do it to be sure). So my guess is you just need a card that'll load them all into video memory and not use virtual memory. Ok guys, since the app is pretty much done I've officially added it to my webpage. This was an experiment and I much preferred doing rapid development this way and then posting the app once it's stable. All previous versions of the file have been removed from these posts to avoid confusion. The latest version (5.1) can be acquired via my site, which you can get to by clicking on the Dragon King logo in my footer. Thanks again for all the work you did on this !! -- I did notice one thing that may or may not be fixable -- If using a key combination for exit that doesn't include the escape key (ie. using 5+6 (ie. Coin 1 and Coin 2 buttons)) If you press the escape key it activates the window frame bringing up the original game window with the Options - Default ? - Zoom - Orientation bar. If nothing can be done to keep that from happening it isn't really a big deal (figure most that are using the button combo are doing so for a cab that will not have an escape button thus the need for a combination set of buttons) but wasn't sure if you had seen the behavior or if there was a fix possible so figured I'd post about it. Page created in 0.288 seconds with 172 queries.